Locality: Kamariza dump, Lavrion, Attikí Prefecture, Greece Link to MinDat.org Location Data. Name Origin: Named as the Zn analog of olivenite. 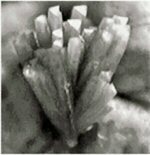 Comments: B&W image of prismatic, triangular zincolivenite crystal aggregate. Location: Kamariza dump, Lavrion, Attikí Prefecture, Greece. Scale: Not Given. Comments: Green crystals of zincolivenite (Co-adamite) associated with keyite, and schultenite. Location: Tsumeb mine, Tsumeb, Otavi District, Oshikoto, Namibia. Scale: See Image. note: Specific Gravity of Zincolivenite =4.36 gm/cc. U=PEZincolivenite x rElectron Density= 163.03 barns/cc.